Roxana Villa lives in the Santa Monica Mountains in Southern California. Here, in her studio, she creates botannical perfumes and beautiful art and in her garden she keeps bees. Her life is intertwined with nature's winged alchemist - the bee. 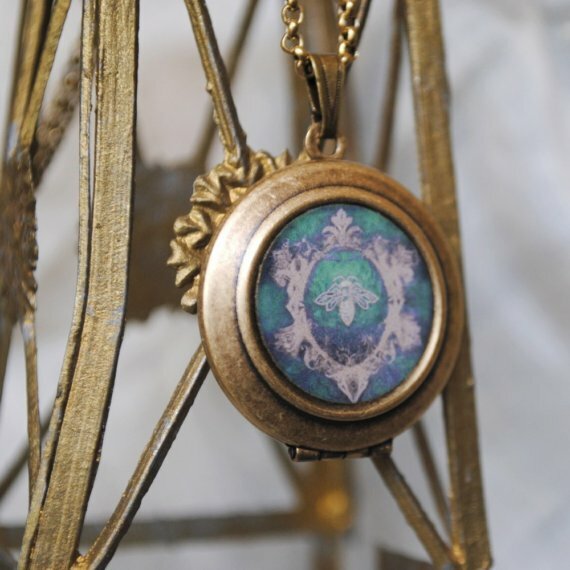 Many of her elegant and intricate designs incorporate bees as seen above in the Honey Bee Antique Brass Art Locket. She uses beeswax in her otherwise completely plant based perfumes - "Beeswax is included in the apothecary of many fragrance artisans, used for the creation of solid perfumes, lotions and balms." ROXANA VILLA in FACTS and FANCIES: PERFUME. An example of this is in her solid handmade cream perfumes that are made with pure essential oils in a base of beeswax and jojoba oil. She writes about holistic, organic beekeeping experiences including her rustic bird house hive at Etsy's Handmade Blog.